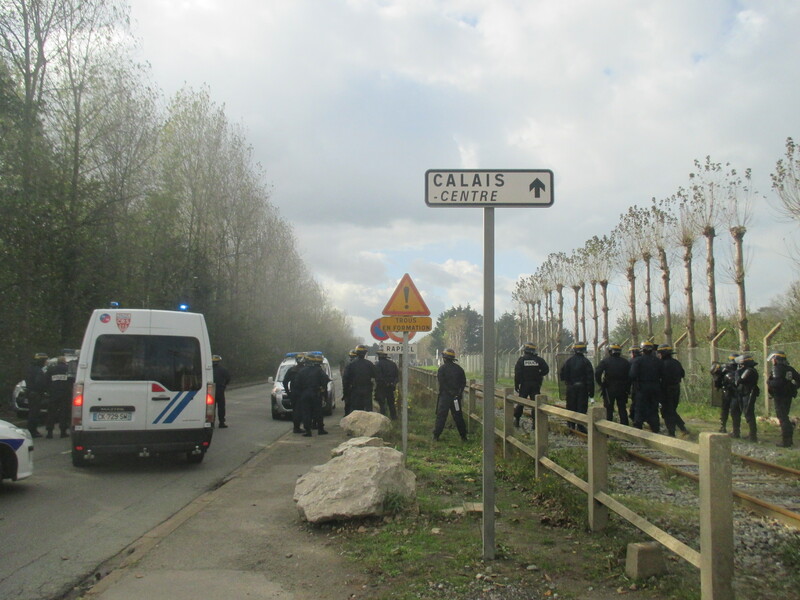 The two main camps in the East of Calais, by the Tioxide factory and in bois Debruille (in front of the Tioxide jungle) are now empty: the people have moved near the Jules-Ferry new day centre, after being threatened by police with forced eviction. They moved to the new jungle under strong winds. Nobody wanted to go there, they just felt they had no choice. The authorities had threatened to send 1000 CRS (riot police) and gendarmerie, and people are afraid – despite governmnent empty promises that the evicitons will not be violent, because police violence has escalated to unprecedented levels The people who wanted to resist eviction were outnumbered by the ones who started moving. Hundreds between Eritreans, Ethiopians, Afghans and Pakistanis are now in the new jungle. The women and children who were in the women’s shelter have been forced to move to a squalid prefab building inside the Jules-Ferry centre, some women are sleeping out in the new jungle because there is not enough space. 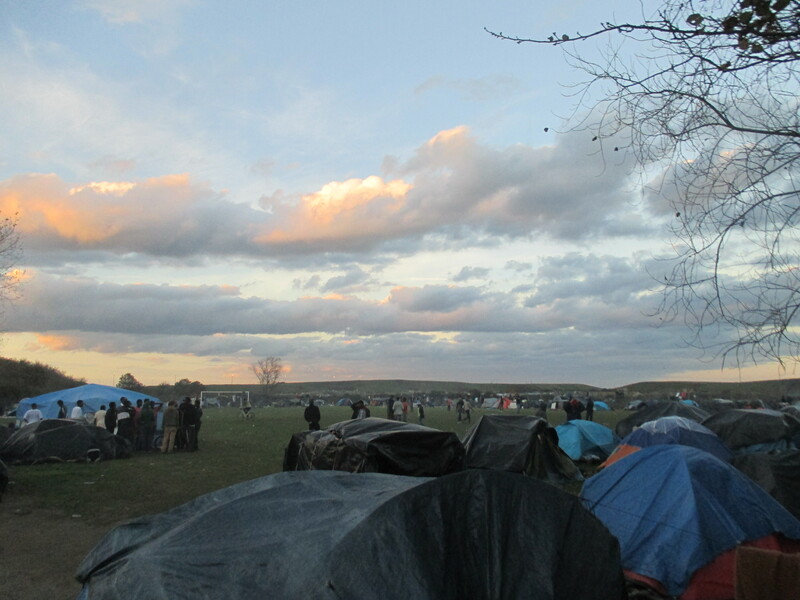 Some people in the squat Galloo have decided to resist eviction, others moved to Jules-Ferry new jungle, some came back to Galloo because the strong winds blew their tents. Most people in Galloo are Sudanese but there are also Egyptans, Syrians and other Arabs, some Ethiopians and some women. The 12.000 m2 squat Galloo was opened by NoBorders as a response to the evictions last Summer and is not far from the train station. 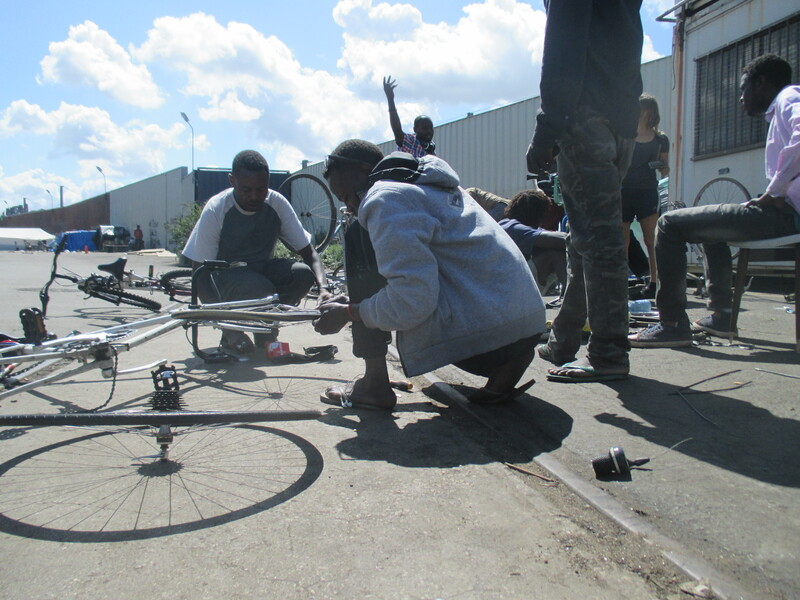 The Sudanese in the jungle by the LeaderPrice supermarket, West of Calais, are moving to Jules-Ferry. The Syrians who sleep out in town are refusing to move. The Egyptians in their small squat are still there, and the Sudanese by the old cold weather shelter (BCMO) are still there. The Afghans by the LIDL supermarket near Marck are still there but about to move. There are not even toilets in the new jungle, nor drinking water outside the opening hours of the Jules-Ferry day centre, not even a skip for the rubbish, and no roads. The authorities say they will put a water tap outside the day centre and they will build a road – some say the road will be used by the police. The authorities have refused to provide any tents or shelters and the associations who help the migrants are struggling to find materials to build new shelters, tents and money to buy them: they receive no public funding and they don’t even have enough tarpaulin. There is massive local, national and international solidarity and so many people going to Calais to support the migrants like never before, and a strong and continuos No Borders presence. It is not too late to build a strong campaign against racist segregation, against police violence, for freedom of movement and for people’s right to have a roof and three meals per day. According to the authorities’ plans, all people must move to the new jungle–ghetto near the new day centre Jules-Ferry, where they will be ‘tolerated’, and bring their tents else they will be destroyed. The centre is in the middle of nowhere, out of town and out of sight and is open only by day. No accommodation is provided, and only one meal per day. A hundred women and their children are allowed to sleep in the centre – they have been forced to go there, where they have 4 m2 each at their disposal in a prefab. The issue of many unaccompanied minors is not even addressed. 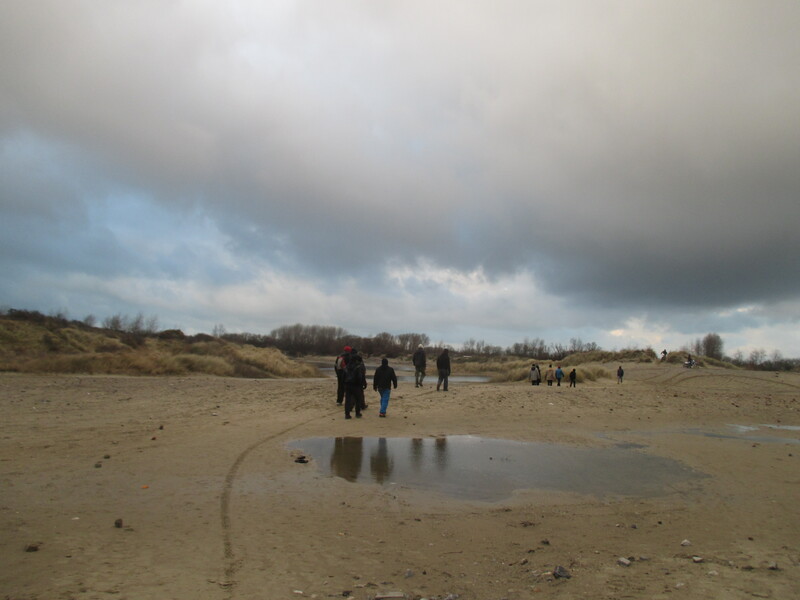 The ground near Jules-Ferry is covered in water, sand dunes and thorny bushes and it is not suitable for building shelters or pitching tents. There are no houses around, no roads and no shops – and no potential witnesses. Police are regualry circling the roads, beating people up and spraying them with gas –though the worst violence happens when people are trying to cross to England; not even women and children are spared. I think people are so scared that they could not find the heart to resist the evictions, despite long-running attempts to organize, with the support of No Borders and associations. All people can think of is to get out of Calais as soon as possible, they go to try for England every day and every night braving the police truncheons and the gas, and in that they are very courageous. Some of the best migrant activists went to England, so we lost them to the cause – though we are happy they made it. In the past there have always been some form of resistance when evictions came. Other violence comes from lorry drivers, security and Nazis linked to the collective Sauvons Calais, who also attack activists and volunteers. It would be great if antifa could come to Calais more regularly and moreoften, especially at week-ends when the Nazis do their rounds – though the Nazis are nowhere to be seen when lots of anitifa turn up! The local antifa are very few. Most migrants in Calais are refugees from the most oppressed and war torn countries in the world: Sudan (Darfur and Nuba Mountains), Eritrea, Ethiopia, Afghanistan, Syria. Numbers of migrants have gone down from over 2300 at the end of 2014 to less than 2000. Many people have managed to go to England despite increased police violence and border controls, and a new fence that falls down every time there is strong wind. Some people have applied for asylum in France, some have been given accommodation, often far away from Calais, some are still in the jungles. A few have returned to their countries. Fewer people are coming to Calais since Italy resumed taking finger prints, under pressure from France and Europe. The day centre Jules-Ferry, while trying to make the French government look good by providing some essential services at substandard levels, is yet another step towards segregation and creates new problems that cannot be solved. Nobody wants to go to the new jungle. It is very far from everything, in a wasteland where hunters shoot wild animals and the ground is littered by thousands of empty cartridges. The area has also been used for dumping waste and there could be amianth, and is under toxic fumes from the factory. There have been already racist attacks near Jules-Ferry, that is a major target for the Nazis of Sauvons Calais who do not want migrants nowhere near Calais. 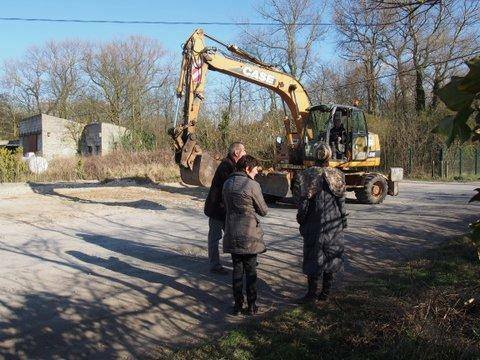 Some local people have threatened to destroy new shelters with a digger when the first migrants moved there. People are being pushed into the areas controlled by smugglers. Women have no protection from men who want to force them into prostitution. Near Jules-Ferry the police will be free to beat and gas people as they wish, in the absence of witnesses, especially at night when the employees and volunteers of the day centre go home – there are no houses, no shops, not a sign of civilization. To force all people from different migrant communities in the same place creates a very dangerous situation, and if a fight breaks out nobody will be able to stop it. Migrants are afraid police will not let them leave the new jungle to try and go to England. There is an international call out to go to Calais and support the migrants. There is also a call out to collect tents, money and materials. The management of the current refugee crisis in Calais requires other means than to force all and everyone in a jungle-ghetto. Some decent accommodation must be made available to everybody, possibly in structures with no more than 100 people in each, near shops, roads and houses so migrant people are not cut off society. Every country in Europe must take its share of refugees. Legal ways of travelling must be made available to all, and especially to those fleeing conflict. Better still, borders should be abolished and people let free to go wherever they want. People must be allowed to settle in European countries of their choice, other than the first country where they have been identified (according to the Dublin regulations). 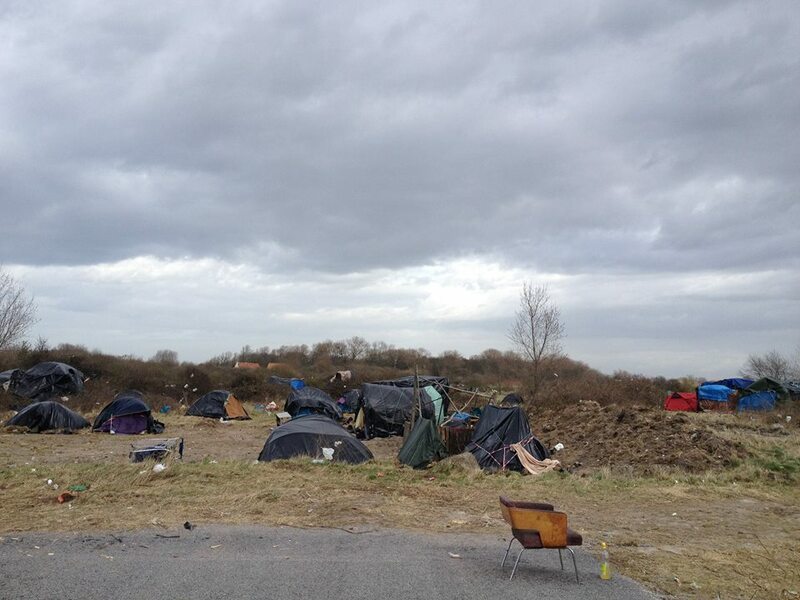 If people had the freedom to move they would not accumulate in Calais, where they do not want to be. So the refugee crisis in Calais would be resolved, fully resolved! No borders, no nations, no racist segregation! Video of the new jungle: must watch! Questo articolo è stato pubblicato in Senza categoria il 31 marzo 2015 da EXODUS - watchtheborders. The authorities have announced all camps and squats will be evicted after the end of March. All migrants must move, willingly or by force, to a new jungle–ghetto near the new day centre Jules-Ferry, where they will be ‘tolerated’ – not allowed to stay! The centre is situated in a wilderness in the middle of nowhere, out of town and out of sight. No accommodation will be provided, the centre will be only open by day. All men and boys can bring their tents, else the tents will be destroyed. There are many unaccompanied minors, the youngest age 12 or less. A hundred women and children will be allowed to sleep in the Jules-Ferry centre – in fact they have been ordered to move to Jules-Ferry centre, where they will have 4 square meters each at their disposal in a prefab. A disaster, as far as the protection of women and children is concerned: they will pretty much be given into the hands of people smugglers and prostitution rings. All services will be concentrated there: meals (one meal per day only), showers, clothes distributions, information about asylum in France and voluntary returns. Previously all these services, except the showers, were in the centre of town. The UNHCR have returned to Calais to collaborate, or give a humanitarian face to the planned evictions, by trying to persuade people to ask for asylum in France, so it looks as people are being given an alternative: asylum seekers are eventually offered accommodation, even though it takes months. OFII staff (Office francaise de l’immigration et l’integration) are touring the jungles, searching for potential asylum seekers, accompanied by police. A sure sign evictions may be imminent. In 2009 the UNHCR came to Calais and they did not say a word about the evictions – at the end of 2009 all jungles and squats were evicted by force in a futile attempt to ‘persuade’ migrant people to leave Calais. The management of the centre has been given to an association of Arras, La vie active, who have never worked in Calais. The local associations like SALAM who have supported the migrants for years were not even counsulted. There are no houses there and no potential witnesses: people will have no protection in case of fights or police brutality, especially at night when the employees and volunteers from associations go home. At present police do not usually go into the camps – though that could change – but they are circling the streets around the camps all the time, beating and gassing people. Migrants are also afraid police will not let them go out the new camp to try to go to England. There are fewer migrant people in Calais now, numbers have gone down from over 2300 at the end of 2014 to less than 2000 – however the idea there are fewer than 1000 migrants in Calais now is a fantasy. Many people have managed to pass to England, despite increased police presence and police violence against those trying to cross. Many people have opted to ask for asylum in France, some have been given accommodation – though many asylum seekers are still in the jungles, waiting to be housed. The numbers of Eritreans have greatly gone down since Italy resumed taking finger prints, under pressure from France and Europe – the French Minister of Interior Bernard Cazeneuve went to meet his Italian counterpart Alfano to this end. The numbers of Afghans have gone up. The numbers of Sudanese and Ethiopians have gone down but less dramatically. Syrians are about the same number as before and Egyptians maybe in slightly increased numbers. At the border there are several types of controls: they check lorries for carbon monoxide, they send suspicious lorries to the scanners and they use sniffer dogs (the dogs are the most effective at finding people). Yet when there is much traffic they cannot check every vehicle. The usual way to cross the border for people without papers is to hide in the back of a lorry before it enters the ferry port or gets into the Eurostar trains, but many, especially the Sudanese, board the Eurostar directly when it slows down, holding under the train – some also hold under lorries. It is a dangerous way of travelling and several people died crushed by lorries, especially in the last year, or broke their limbs falling from the trains. Due to increased numbers of migrant people stranded in Calais, they also try to board lorries that are moving, even in broad day light. It is spectacular: you can see hundreds of people running after lorries, opening the lorries when they slow down and getting inside, or going below. Such is the desperation to get into England. The response of the French authorities has been to escalate violence against those who are trying to cross. Human Rights Watch has published a report concerning the violence by police, as well as the extremely poor living conditions people are forced into. Amongst the people they interviewed, an Ertrean woman, Rosa, says she was beaten unconscious by police and woke up in hospital with a broken leg. 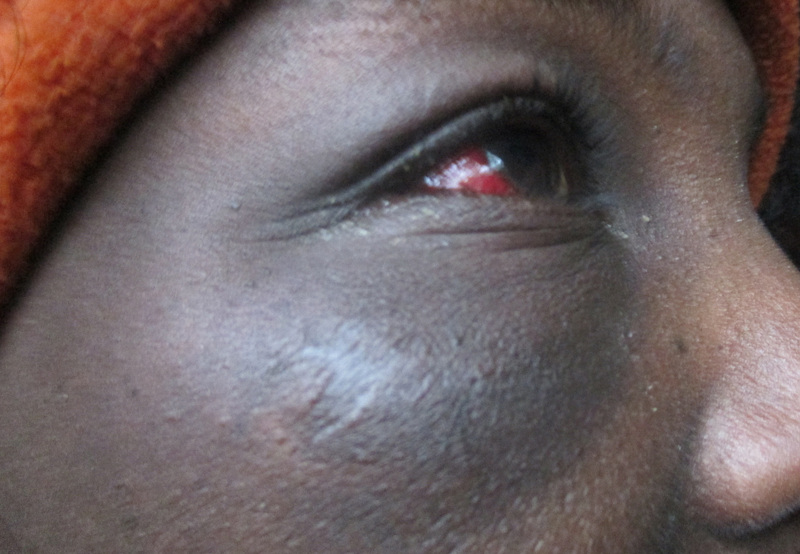 Two children interviewed by HRW say they were ill treated by police and pepper sprayed. 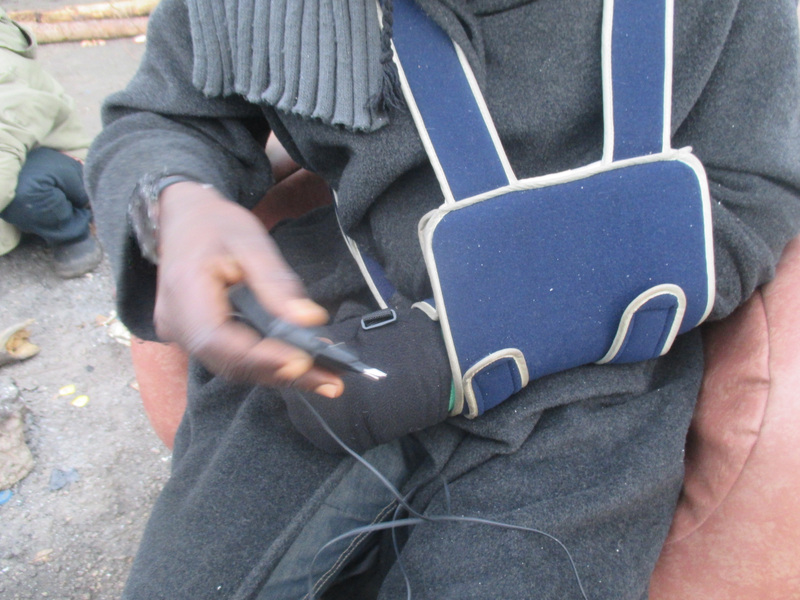 A Sudanese man had an arm broken in three places after an encounter with the police. Human rights watch are neither independent not unbiased, but this report is really good. Watch the video. A local activist network have collected hundreds of testimonies of people beaten and ill treated by police. It appears police violence is routine, not sporadic or reducible to bad behaviour by a few individual officers – though some policemen ‘distinguish’ themselves in hurting and injuring people. It is usually the CRS (riot police) who beat and gas people. They even gassed me for no reason, as I was walking from the jungle! Probably they mistook me for a migrant. The indiscriminate use of pepper spray and batons by police also causes deaths and injuries, as people run on the motorway to escape the police, sometimes without seeing where they are going because they have been pepper sprayed in the eyes at close range. Some activists witnessed a group of Eritrean being pushed purposely on the motorway by some policemen. At least 15 people have died in Calais in the last year, the highest number ever. Most have died on incidents on the motorway. Many more have been hospitalized with broken bones and internal injuries after being hit by cars. The authorities, from the Immigration minister to the prefect, keep denying there is any violence committed by police, and say injuries are sustained when people try to get into lorries, or caused by other migrants. Unfortunately, obtaining video evidence of police violence has been very difficult because police also assault people with cameras and destroy their footage. A Channel 4 journalist had a wrist broken by police while filming on the road near Tioxide, and has pressed charges. A 9 years old boy from Afghanistan was pepper sprayed in the eyes when filming cops on his mobile phone. Other violence comes from lorry drivers and security – there is a new video showing security guards and lorry drivers beating migrants they have found in a lorry. It was taken by a Romanian lorry driver who does not agree with such violence. A young Ethiopian man died three days after being hit on the head by a lorry driver. Coincidence? The ultrasound post-mortem did not find a direct link and the coroner passed a verdict of ‘unexplained death’. I was in Tioxide jungle when a man called me, he was kneeling down and tying his shoes and asked: ‘Please, I need help!’ I answered that I had no shoes to give, he said: ‘No, no, I need to talk! Someone died!’I saw he was crying. He led me to a small camp. The body of Tesfaye was in a little shack where he had died alone. His friends left him in the morning, when they returned in the evening they found him dead. Everybody was crying but his close friends were sobbing uncontrollably. The squalor of the place and the beautiful stars. it was unbearable. The sound of so many people crying. And the poor man lying lifeless. He was a wonderful young man and very much loved. Ethiopians kept arriving from all jungles and squats of Calais and from the women’s house. Some Afghans who had gone there to help and speak English a bit better called the police. The police arrived in excessive numbers and were very intimidating. They stood between the dead man and his friends with truncheons in hand and cans of gas. I complained but to no avail. People were saying they do not trust the police. Some recognized the policemen who had beaten them up before. Many refused to talk to the police. After some hours the body was taken away, and the entire Ethiopian community in mourning went to pray in the church in the Tioxide jungle. In the following days, 3000 euros were collected by Tesfaye’s friends to send the body home, in the jungles of Norrent Fontes (one hour from Calais), Tioxide, bois Debruille, in an amazing show of solidarity amongst people. Everybody gave what they could, even they have so little and the Afghans gave a lot of money. There are three big jungles in Calais now, a big squat opened by No Borders activists, and some smaller camps and squats. There is no water, no electricity, no toilets in these places– except there is water in the squat Galloo and Medicins du Monde built some makeshift toilets there, and some toilets and shelters in the Sudanese jungle. 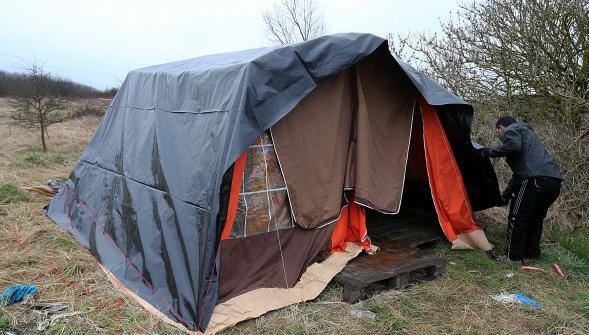 People live in terrible conditions, in small shacks they built themselves or in tents they got from local associations and international solidarity – there are people from various European countries collecting and sending tents, blankets, clothes etc. to Calais. People in the jungles do the best they can: they even built a school, restaurants and a beautiful church in the jungle by Tioxide, and there are shops and mosques in the other jungles. A wonderful retired couple bring a generator around the jungles so people can charge their mobile phones and listen to music. – link – A great imam from a mosque near Lille goes there to lead prayers and to bring food and other essential supplies. Many volunteers, local people and activislts go to the jungles very often. Some of us even sleep in the jungles. International solidarity: join the UKHIP! The French government washed their hands of these dispossessed migrants, most of whom are refugees from the most war torn countries in the world. Since they closed the Sangatte refugee camp in 2002, under pressure from the UK government, people have been forced to live in the woods, they themselves nicknamed ‘jungles’ , or in derelict buildings, subjected to heavy harassment by police including beatings, destructions of shelters and arbitrary arrests. 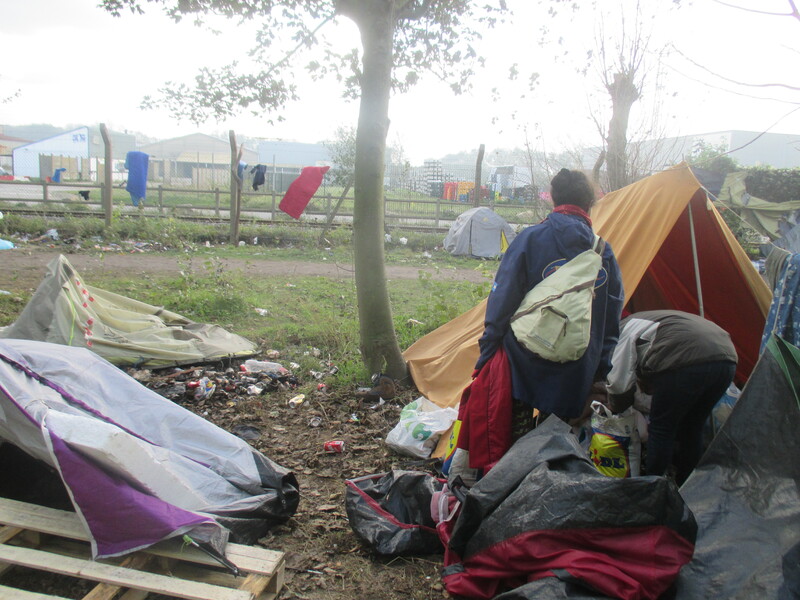 The jungle near the Tioxide factory was the most populated, now many tents are empty since there are fewer Eritreans in Calais, and fewer women and children. In fact there is only one little boy left, other children sleep there occasionally when they go to try to go to England with their mums; this boy and his mother did not fit in the women’s house, though they did fit very well in the squat Victor Hugo… and we love that boy. There are also Sudanese living in Tioxide, Ethiopians, Africans from other countries, Pakistanis, Afghans, Egyptians and other Arabs. They all stay with their fellow nationals, but there is good harmony between groups. In the wood Debruille, on the other side of the road, there are more people than there were in winter. Most are Pashtoons from Afghanistan. They are in front the old Pastho jungle that was destroyed in 2009. Most of them chose to apply for asylum in Italy because it is the only European country where they get refugee status easily. Then they go to England to work – finding work in Italy is next to impossible. There are also Afghans from other ethnic groups, and numerous Ethiopians including women, who moved there months ago from Tioxide, after big fights with the Eritreans – now the fights are over but many Ethiopians are still there. One is a woman with big Afro hair that has gone very scruffy after months living in the jungle; the Afghans have nicknamed ‘Palawana’, I don’t know why, Palawan means big man and she is a woman and quite small, the Afghans like her and they say Palawana is a good girl. There are some Iranians, strange because traditionally the Afghans hate Iranians, and some Arabs, very numerous unaccompanied minors, especially young Pashtoons but also young Arabs, and sometimes there are families with little children. There is one water point only for all the people living in Tioxide and bois Debruille. The authorities kept closing this water point down until the HRW report came out – I have no evidence there is a direct link but I suppose so, since the report specifically mentions access to water, or lack of. There is a small Ethiopian camp not far from Tioxide, that is where Tesfaye died. There is a smaller Afghan jungle near LIDL in Transmark that is controlled by smugglers. Don’t go there, or be careful. The third big jungle, by LeaderPrice, is at the opposite end of town, and is inhabited by Sudanese, most from Darfur. They try to go to England via Eurostar. Tioxide is closer to other points of passage, by the motorway leading to the ferry port. The squat Galloo, opened by No Borders, is near the train station and next to the sites of the old Sudanese jungle and the now demolished squat Paignez, that housed thousands of Sudanese, Ethiopians and other Africans from 2002 to 2010. The squat Galloo is massive, 12.000 square meters, and is home to a majority of Sudanese, most from Darfur, and a minority of Syrians, Egyptians and other Arabs, a group of Ethiopians and a few No Borders activists. There is a women only space where migrant women and female activists can sleep. There is another small squat in the centre of town inhabited by 50 Egyptians, it is a mystery how they all fit in such a small building. There are three small camps in town, two inhabited by Syrians and one by Sudanese (and sometimes other Africans). Most women and their children are in a place for women only, but there is not enough room for all the women. The first shelter for women was a squat opened by No Borders activists in 2013 in Boulevard Victor Hugo. Thanks to a sustained campaign the authorities could not put the women again in the streets. Instead they confiscated the day centre of Secours Catholique and transferred the women there, under the management of a Calais association, Solid’R. Now all the women and children will be forced to move to Jules-Ferry. Unaccompanied minors are in the jungles, looked after by their own communities. There is a shelter for minors in St Omer, half hour train from Calais, but the boys do not want to stay there, though they say it is a good place: the shelter is full only at week-ends, when the boys take a break from trying to go to England. At any rate, the place for minors is far too small to accommodate all the minors who are in the Calais area now. The drive is to push people far from town and isolate them more and more from society. Even the parks where migrants used to gather have been cleared: people without papers can no longer go there without being arrested, nor they can go to the shopping centre because police regularly sweep these places. Migrants have been progressively pushed out of town, despite some remarkable resistance, including occupations, protests and a hunger strike. The Jules-Ferry centre seems the ultimate achievement in rendering migrant people invisible, cast out society and exposed to violence by police, racists and others. It took time and a lot of effort to build these wonderful, autonomous self-organized communities in the Calais jungles most of which are multi-ethnic. To build a multi-ethnic camp requires lots of negotiations, it is not simple and not the most natural state of affairs: the preference is to live with people of the same nationality, because they speak the same language, share the same culture and know what to expect from each other (they are ‘same-same’). To include members of other national and ethnic communities is a complex process. It is simply criminal and totally irresponsible of the authorities to force all the people to relocate in the same place. The argument they have enough space to move apart from each other does not stand up, since most of the land around Jules-Ferry is covered in water, thorny shrubs and sand dunes, and is unsuitable for building shelters – as Medicins du Monde also point out. There are no houses nearby, nor shops, not a sign of civilization; only hunters who do not want the migrants there and are shooting birds where the migrants should go and live: the ground is littered with thousands of empty cartridges. It is close to smugglers’ territory– not all smugglers are bad but some are, and on the way to lorry parks that have been the theatre of very violent fights, resulting in several people hospitalized. It is actually a miracle that nobody has died that way. These fights can sometimes continue for days, involve hundreds of people and expand to the camps where people are sleeping. During the last year we had the worst fights ever. Several people were hospitalized with knife wounds, some almost lethal, and broken bones, after big fights of Egyptians, Sudanese and Albanians against Afghans – everybody wants to take the lorry park of the Afghans, that is defended by a gang of violent smugglers armed with guns, knives and CS gas; these smugglers also hurt other Afghans who try to cross, or simply want to sleep in places controlled by them without paying; they are very different from other Afghan smugglers (running business from 2009 to 2013), who were mostly nice guys, would defend their territory from other smugglers but caused no problems otherwise, and were kind to their own people. 64 African people were hospitalized after two days of big fights between Sudanese and Eritreans, four in serious condition; these fights originated over the control of another lorry park, when the Sudanese wanted to stop the Eritreans from going there. As one of my Afghan friends remarked, to stop such fights is like trying to stop a raging bull who is charging: you can’t. I tried to go to Tioxide on the second evening of troubles: there were some 200 men and boys sitting by the entrance and waiting, in case the Sudanese went there. In the dark I could only see the white of their eyes and their teeth when they were smiling. Their leader told me not to go there. ‘You are Afghan, go with the Afghans’ he said. I said: ‘Oh, I’m just worried about the women and children’. ‘Don’t worry ’ he said. Three days of battles between Eritreans and Ethiopians ensued after the Eritreans told the Ethiopians not to go any more to a parking they were using: I saw 400 people throwing stones at each other and running after their rivals armed with metal bars, just outside Tioxide jungle; the police managed to break that fight, and I must say they behaved well on that occasion, at least they did not use excessive force. The Eritreans told the Ethiopians to leave Tioxide and destroyed their tents; 50 Ethiopian and Eritrean women, children and some teenage boys went to sleep in Galloo because they were afraid, or in the women’s house. It took time to bring peace between the two communities, but now they are getting on well. More recently, there was a night time attack by Sudanese on innocent Afghans who were sleeping in bois Debruille, and have nothing to do with the smugglers – they moved there precisely to get away from their control. Several tents were slashed with knives including tents where some minors were sleeping. The Afghans reacted and beat the Sudanese up really bad. Afterwards, they brought the casualties to the road for the police and ambulances to collect them: one had a broken leg, another a head wound; one Afghan was also hospitalized, many escaped with minor injuries. The Afghans say they do not like doing things like that, but if attacked they defend themselves. I hope I did not give a bad impression of the Sudanese, most of whom are very nice people, highly intelligent and very kind, only a minority are crazy. Police breaking a big fight between Eritreans and Ethiopians. Tents were destroyed, and the Ethiopians were told to leave Tioxide. The authorities know all this has been happening, but they do not care putting people in danger. If a fight breaks out near Jules-Ferry, who is going to stop it? The place is out of town and there are not even roads to get there. A hundred women and children will be allowed to sleep in the centre – forced to go there, where they will have 4 square meters each at their disposal in a prefab, very substandard accommodation. Women migrating are in the same danger as men, and in double danger of exploitation, by men who want to sexually exploit them / get them into prostitution: that is why they need to be in a place of their own, where men have no access. To enter/ exit the Jules-Ferry centre women will have to pass through the space of the men; that is, the territory controlled by smugglers. Many women have already been raped or sexually exploited during their journeys, and arrive in Calais traumatized and with unwanted pregnancies. At the local hospital they are refusing to perform abortions on migrant women, saying they have no funding for that. There has already been a string of racist attacks on the road to Jules-Ferry , that seems to be a major target for the Nazis of Sauvons Calais, as they do not want any migrants to settle in or near Calais – that migrants have no intention to settle there and are simply trying to go to England does not make any difference to the fash. People are going to Jules-Ferry for their evening meal since 15/ 01/ 2015 and isolated migrants have been attacked on their way to the centre. The hunters are on the warpath too, as they feel their hunting territory is being taken away – they wrote ‘CHASSEURS EN COLERE’ on the way and on the door itself of the centre Jules-Ferry. The centre Jules-Ferry, far from providing solutions to the refugee crisis in Calais, creates new problems that cannot be solved. It is absurd to order people to relocate in a new jungle around the centre where they will be ‘tolerated’, as the ground is not suitable for building shelters or pitching tents. The basic right of people to have some form of decent accommodation, regardless of their immigration status, is violated. Concentrating too many people of different nationalities and ethnic groups in the same place creates a dangerous situation . There are no roads to get there. If a fight breaks out, it will be impossible for the police to stop it. People will be pushed into the hands of smugglers. There have been already several racist attacks near Jules-Ferry. There are hunters shooting wild game near the centre, and they do not want the migrants there. The concentration of all services in the Jules-Ferry day centre (meals, clothes, showers, legal advice) is functional to create a new ghetto. One meal per day is not sufficient. The rights of women and children are grossly violated as they cannot be protected in such a place. Women need a place of their own, else they cannot be protected. The accommodation offered to women and children is substandard. The problem of many unaccompanied minors is not even addressed. The management of the centre has been given to an association that have never worked in Calais and have no experience or knowledge of the issues. The police will be free to beat/ gas people as they wish, in the absence of witnesses – there are no houses around. Migrants are afraid the police will not let them leave the new jungle. The management of the current crisis in Calais requires other means. First of all some emergency accommodation should be provided to everybody, with access to water, electricity and sanitation. Women and children need a specifically dedicated place. Families and unaccompanied minors need specifically dedicated places. It is futile to try to persuade people to apply for asylum in France when they have families in England, even more futile when they have finger prints in Italy. Solutions should be found by allowing people to settle in different European countries, others from the first country they have been identified (Dublin regulations), also taking their preferences into account. Every country in Europe should take its fair share of refugees. If people had some freedom to move and to stay, they would have no reason to accumulate in Calais. Legal ways of travelling should be made available to all, especially to those fleeing conflict. Better still, borders should be opened and people let free to go wherever they want. It appears that, increasingly, migration is forced migration: that is, people leave because they are in fear of their lives and / or can no longer make a living in their own countries. Addressing the causes of forced migration would be better than to try and contain the mass of people who migrate, usually by very violent and repressive means that imply the infringement of their most fundamental human rights. If the Western powers stopped exploiting other continents for resources, bombing other countries, invading other countries, fomenting wars by proxy and arming dictatorships it would help. The ‘management of migrations’ as they intend it fit in the same frame as colonialism, slavery, racism and shows utter disregard for human beings. With the impending probable evictions at the start of April, there is an invitation to you and your friends to come to Calais in the month of April and plan an event to highlight the foolishness of the Border regime and those who defend it. For example the Mayor of Calais , Natacha Bouchart recently passed a law to make it illegal to distribute free food in the centre of town to try to force people to go and eat at the new Jules Ferry isolation centre, 7 km outside Calais ( see our feelings on the new centre in more detail on the blog ). There will only be one meal per day at the new centre and communities would much prefer to cook for themselves and not receive charity. Another example of the foolishness is that the centre is in a hunting area and at a meeting with the Sub Prefect ( French Government representative) last week, he said not to worry because he had told the hunters to ‘ take care and as they will be firing up in the air at ducks it should not be a problem !’ There are many, many more…. We can show the Border regime and its protectors to be foolish in so many creative ways so please come armed with your metaphorical Poissons D’Avril in what is a crucial time in the Border struggle in Calais.